Remove legs from bird by pushing hip joints out of the sockets and cutting free with small knife. Cook legs slowly in small roasting tray, just covered with duck fat, 2 cloves of squashed garlic and a stick of thyme. Cook for 45 minutes or until tender. Trim partridge crown and seal in hot pan. Drape one rasher of bacon over breasts and put in a hot oven (200°c) for 10 minutes. Remove from oven and rest in a warm place for 3 minutes and discard the bacon. Carve partridge breast from carcass by cutting down either side of the breast bone and then follow the rib cage out to winglet. Cut both breasts off. 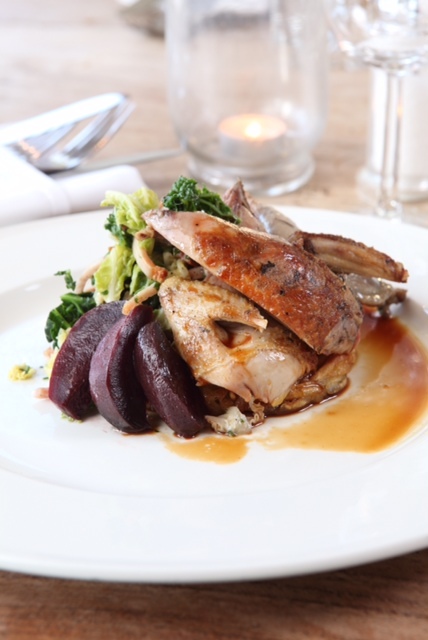 Ideally serve the legs & breasts on a potato rosti, sautéed savoy cabbage with bacon & roasted beetroot. Spoon a light game jus around the outside. Part boil the potatoes in their skins for 10 minutes and allow to cool. Peel the skin away and grate the potatoes. Season and add 50g diced butter. Fry the potato in a little oil and butter using a pastry cutter to keep the shape. Fry for 2-3 minutes on each side until golden brown. Peel two large beetroot and chop into wedges. Put into a roasting tray with a little oil, a glass of red wine and two sprigs of thyme. Season and roast in oven for 1.5 hours, gas mark 4. Finely slice the bacon, onion and cabbage, chop the garlic & thyme. Fry the bacon, onion, garlic & thyme in a large pan and add the cabbage and some pepper. Add a splash of white wine and half of the vegetable stock. Keep cooking over a low flame for 7-8 minutes whilst stirring and gradually adding the remaining stock. Add a teaspoon of butter and check seasoning.